Gast Pump Extension Legths: 10, 20, 30, 40, 50 Ft. 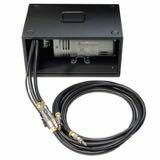 The Gast pump hose extensions are used used in Clean Air's Isokinetic control console. The hose extensions are recommended to be used when the pump needs to be located away from the console. Click the button below to add the Gast Pump Hose Extension to your wish list.